Maine is the only state in the country that provides all indigent defense services through private attorneys. There are two principal reasons that other states have moved away from using solely private attorneys. First, it is difficult to predict and contain costs in a private attorney system. Second, it is difficult to supervise private attorneys to ensure they can and do provide effective representation. Maine struggles with both, as the Maine Commission on Indigent Legal Services is expected to oversee the representation by and cost of nearly 600 attorneys, handling more than 30,000 cases each year in 47 courthouses presided over by approximately 90 justices, judges, and magistrates, with a staff of just three people. Maine cannot guarantee effective representation in each and every case, as is their Sixth and Fourteenth Amendment obligation, as the failure to provide oversight often results in the interest of indigent defendants being in conflict with the financial interests of the attorneys appointed to represent them. 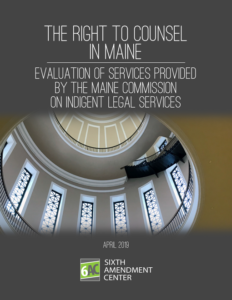 A report by the Sixth Amendment Center, The Right to Counsel in Maine: Evaluation of Services Provided by the Maine Commission on Indigent Legal Services (April 2019), examines the state’s private assigned counsel system against constitutional right to counsel standards. The report was prepared for the Maine Legislative Council, a ten-member body consisting of leadership from each legislative chamber and that governs the administration of the Maine Legislature. The 6AC finds that the Maine Commission on Indigent Legal Services (MCILS), created by the Legislature in 2009, does not meet its statutory mandate to: “provide efficient, high-quality representation to indigent criminal defendants, juvenile defendants and children and parents in child protective cases, consistent with federal and state constitutional and statutory obligations”; “ensure the delivery of indigent legal services by qualified and competent counsel in a manner that is fair and consistent throughout the State”; and “ensure adequate funding of a statewide system of indigent legal services, which must be provided and managed in a fiscally responsible manner, free from undue political interference and conflicts of interest.” Rather, MCILS administers a private attorney system that compensates attorneys in a method that places the case related interests of indigent defendants in conflict with the financial interests of the attorneys appointed to represent them, that results in uncounseled defendants routinely negotiating plea agreements directly with prosecutors, and that, due to lack of oversight by MCILS, cannot guarantee constitutionally effective representation of defendants in each and every case. The 6AC recommends that the State of Maine authorize and fund MCILS at an appropriate level to employ state government attorneys and support staff in a statewide appellate defender office and a trial level public defender office serving Cumberland County (Portland). In addition, 6AC recommends a statutory ban on all public defense contracts for private defense counsel that provide financial disincentives to or that otherwise interfere with zealously advocating on behalf of the defendants’ stated interests, including the use of fixed fee contracts. Finally, 6AC recommends statutorily barring communication between prosecutors and unrepresented defendants absent effective waivers of the constitutional right to counsel. The Right to Counsel in Maine: Evaluation of Services Provided by the Maine Commission on Indigent Legal Services (April 2019), is available from the Sixth Amendment Center in electronic format only.